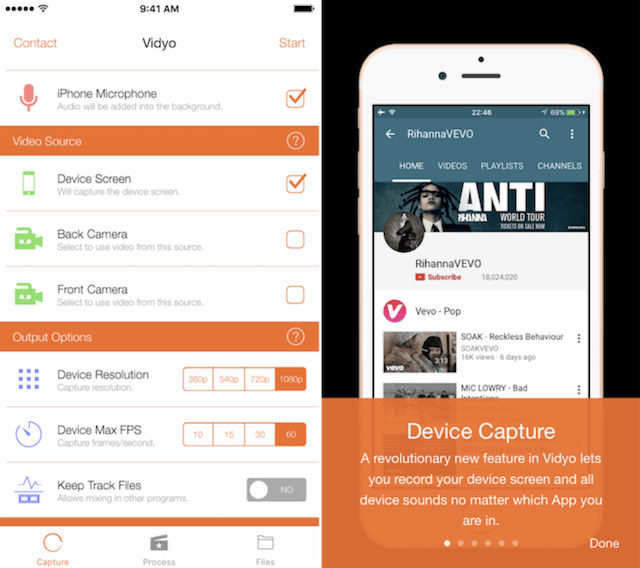 Airshou is a well known screen recorder application that works perfectly on iOS without any jailbreak. This app is compatible with almost all iOS devices. In this article, we are going to show you a full tutorial on how to download Airshou app to your iOS device and use it to record your screen on your iPhone or iPad. If you are looking for a quick screen recording on your iOS device and you are running iOS 11, then you can use the built-in recording feature of iPhone . Part1. Where to download and how to download Airshou app? Part 1: Where to download and how to download? 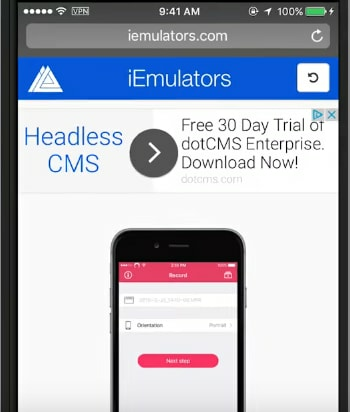 Step 1: First of all you need to open safari on the iOS device. Step 2: Now it is time to search for a website named as iemulators.com. Step 3: Simply tap on the airshow install button on your device screen. 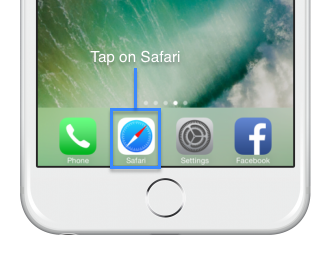 Step 4: Hit install button to adding it on your home screen. Step 5: Finally your application will be downloaded within few minutes. Step 6: Just enjoy your app. 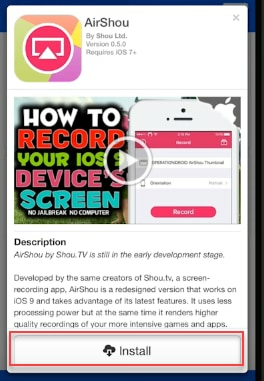 Part 2: How to use airshou to record screen? 1. At very first stage, you need to trust the application. This task can be completed by simply visiting settings, then go to general and then hit profile setting option. Select Airshou and then hit trust button on your screen. Finally confirm the process. 2. Now you can open this application on your device and hit the record button to start screen recording. Users can do customized settings for resolution. 3. It is time to start airplay but ensure that mirroring is ON in your device. With this recording process will be initiated. 4. Once you finish your recording then go back to the application and hit the stop button. 5. 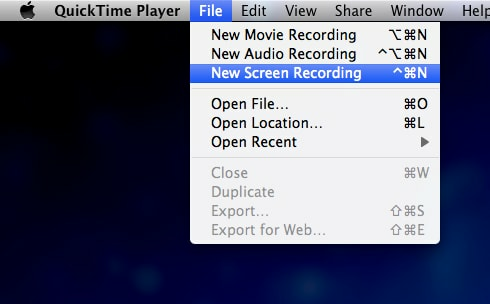 You can preview your recording and once finalized then save it directly to any preferable location on your device. 1.It is one of the most efficient screen recording systems for your iOS device that utilized very few resources from processor. 2.You can easily record games using this application as well as can create tutorials for other applications. 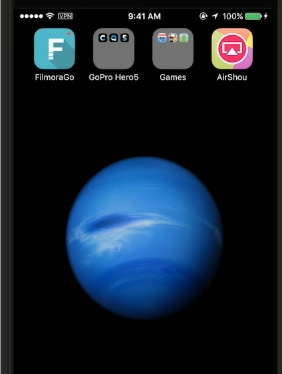 3.Airshou can develop videos at 1080P with 60fps capabilities. 4.It offers very high quality for stereo recording. 5.It can be easily installed on iPhod, iPad and iPhone like devices. It is also a screen recorder application same as Airshou that you can access easily from app store with payment of $4.99. This application can assist users to capture the entire screen on device with ease while capturing the audio information. You can install this advanced application on your device with the help of Cydia Impactor tool and it is compatible with iOS 10 as well as 9. Advanced technology for video recording that takes lesser storage space and bandwidth. Users appreciate its flexible file formats. If you want to record the screen on your Windows PC or Mac with an easy-to-use yet powerful enough screen recording software, we recommend you to try Filmora Scrn, which is a specially designed screen recorder with built-in video editing features.